For further details on this genre of painting refer to Mildred Archer, "Company Paintings" (1992), pg. 43-66. With the continued decline of India's ruling classes and a shift in the patronage of art, artists of the Mughal/Muslim courts migrated to the new centres of art patronised by the British. Thus the Persian inscription suggests the work of a Muslim artist. Stylistically these paintings conform to the Thanjavur style of Company school painting. (Refer to Chaitanya, 1994, "A History of Indian Painting: the Modern Period", pg.103). 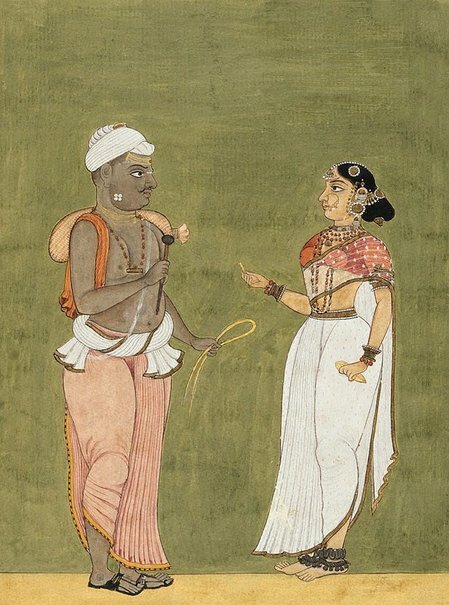 From a series of paintings of castes and their occupations. Asian Art Dept., AGNSW, 11 November, 1997. Warren Hastings, circa 1770-1818, England, possibly commissioned in Madras (Chennai), India by Hastings between 1769 and 1772. Probably exported from India to England, 1785 or before. Held in the collection of Warren Hastings until his death in 1818. Marian Hastings, 1818-1837, England, inherited from Warren Hastings. Charles von Imhoff, 1837, England, inherited from Marian Hastings. Private Collection, pre Aug 1853, England, purchased by a resident on the estate of Daylesford House from a sale of the contents of Daylesford House, Worcestershire (Gloucestershire from 1931), 22–27 August 1853 or before. George Sandwith, 1939-18 Apr 1958, England, purchased on the estate of Daylesford House, Gloucestershire, 1939. Presented by Mr George Sandwith FRGS to the Art Gallery of New South Wales, Sydney. 25 October 1957, received 18 April 1958. Stepping out: three centuries of shoes , Sydney, 2009, 20 (colour illus. ).